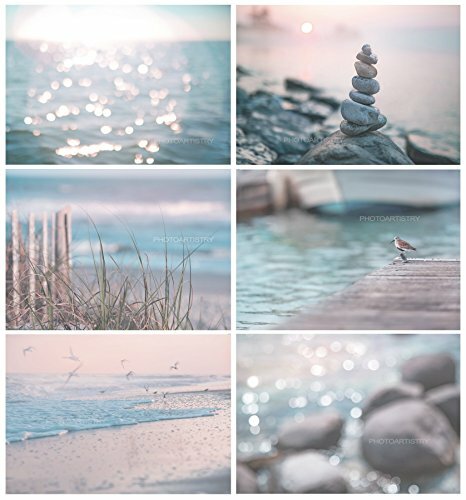 Serene beach art set - whether it's by the ocean or the lake - these images bring back that feeling all year long. In serene colors of Aqua, blue, coral, sand and white - would make a stunning ready to hang display! A beautiful way brighten any space all year long with just the right amount of colors. Size is for each individual piece , not overall measurement of grouping. Ready to hang. Colors may vary slightly due to differences in monitors. Watermark will not appear on final prints. ♥ ♥CANVAS (ready to hang) is archival artist canvas firmly wrapped and secured around a 1.25" base with a white border - neatly folded corners, then sprayed with a satin coating for scratch and UV protection. Finished with black backing board and sawtooth hangers. Ships to US ADDRESSES ONLY. For other print options -such basic photo prints - search "Photo Artistry Beach" above left. If you have any questions or need a custom order - just drop me a line by clicking under my profile photo at right - thank you!